Best armor of the four tier 6 German tanks. Can use the 8.8 cm KwK 36 L/56 which has very good damage. Spaced armor in the area of the engine. 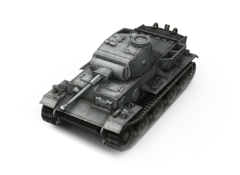 The VK 36.01 (H) is a true heavy tank with good armor, very high HP, and very accurate guns. The 7,5/5,5 cm Waffe 0725 used to be the best gun choice but there's once again a choice to make over it and the 8.8 since the changes to it. The Waffe provides good penetration, high RoF, and accuracy making the tank a highly effective sniper. The mediocre alpha of 135 can be problematic as you're forced to expose yourself more often to keep the damage going. The 8.8 cm KwK 36 L/56 hits much harder while still having decent accuracy and RoF, but suffers from low penetration. While using this gun you will likely have to get a bit closer to take advantage of weak spots, and will very likely need APCR rounds on hand when against tier 8 tanks. 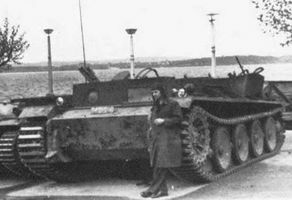 The VK 36.01 (H) doesn't have the best maneuverability and horrible turret traverse. While its top speed is only slightly slower than most medium tanks of its tier, its traverse speed is abysmal. The 8.8 engine changes have also given the tank sluggish acceleration, and simply cannot dream of reaching its top speed unless going downhill. This makes the VK 36.01 (H) much better suited to frontal attacks and slug matches. It follows the German doctrine of long range firepower, so one way to counter this tank is to isolate it and then engage it close up with multiple opponents. When the situation calls for it or when you see an opening in the enemy's defenses, take advantage of this opening and harass the enemy from the rear. This tactic is useful in the mid-late game, and has the advantage of surprise, as the enemy team will most likely not expect a "slow and lumbering pseudo-Tiger" to execute a flanking attack. If you came from the VK 30.01 (H) you should have all the guns already unlocked except for the 8.8 cm KwK 36 L/56, and the Waffe can be used on the stock turret. This page was last modified on 22 September 2014, at 19:11.